The Robot was made by Otto Berning & Co. in Schwelm, Westphalia. This internationally much advertised steel-camera designed by Heinz Kilfitt had two remarkable features, first a modern type of film advance with double exposure lock and coupled shutter cocking, and second a multi-speed kind of rotating shutter from Gauthier, made completely of metal. 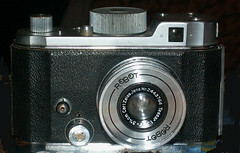 Two versions of the Robot were launched in 1935: The Robot 1 and Robot 2, the Robot 1 with this feature: After release for one exposure the shutter was locked until the shutter was cocked and the film advanced with it. Both versions had the following features: The film had to be loaded into one "K-cassette". After having made the 50 possible 24x24mm exposures the film was coiled in a second K-cassette. The Robot shutter was an own category. The cameras were equipped with fine Zeiss or Schneider lenses. The Robot 2's special feature was the most significant for the whole camera series: a strong spring motor for film advance, made by the Black Forest clock maker Baeuerle & Söhne. That allowed to make a series of images in a few seconds. 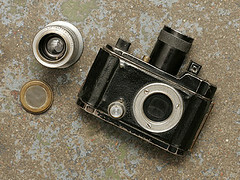 Maybe this feature plus the camera's robust stainless steel body made it one of the prefered cameras of the German army. Especially the German Luftwaffe owned special versions of it with more robust spring motor and a 75mm Xenar lens. The prewar models were equipped with a hybrid finder. 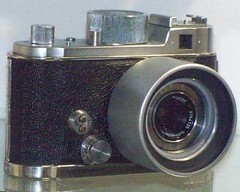 In 1939 the design was changed, with the finder inside the camera top. This design is called the Robot II. The Robot IIa was launched in 1951. It was modified for use with standard 35mm film cartridges. By 1962, the two main models were the Robot Star II and the Robot Royal. The Robot Star II, taking 24×24mm exposures, has an all-metal Rotor shutter (1/4 to 1/500), a direct vision viewfinder, and a screw mount for interchangeable lenses by Schneider. The standard lens is a Schneider Xenon 40mm f1.9. 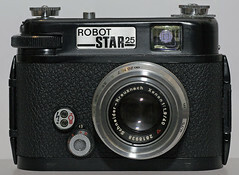 Also available was the Robot Star II/50, with a double spring motor for 50 exposures and a Xenar 38mm f2.8 lens. 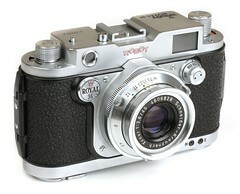 The Robot Royal has "Kinographic" capability of 4 or 5 exposures per second. It has a coupled rangefinder, and a choice of eight bayonet-mount interchangeable lenses. 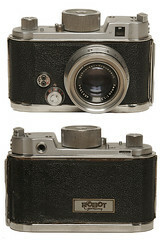 This camera was available in two versions: the Robot Royal 36s has the standard 24×36mm frame size and a Schneider Xenar 45mm f2.8 lens. 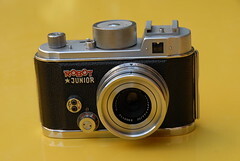 The Robot Royal 24S has 24×24 mm framesize and a choice among three standard lenses, all by Schneider: Xenar 38mm f2.8, Xenon 40mm f1.9, and Xenar 45mm f2.8. Robot cameras were added to professional equipment, for example to microscopes, endoscopes, and ophtalmologic eye-control instruments. In medicine and other sciences the reliable cameras were popular because of the spring motor. Finally the legendary sturdiness of the Robots opened them the market of car-speed control cameras. Example: A Robot Motorrecorder 36 DAP was built into mobile eso µP 80 car-speed control instruments of the police. This page was last edited on 6 October 2017, at 05:21.